Education in the United States must be improved to support greater economic mobility. Those without postsecondary training have experienced stagnant wages, were hit the hardest by the Great Recession, and have barely benefitted from the subsequent economic recovery. All signs point to these trends continuing, so it is imperative that today’s students are prepared for jobs that will position them to support their families and participate fully in America’s economic growth. The modern economy has left behind the nearly two-thirds of workers without a college degree.5 Over the past 50 years, job creation has mainly been in industries such as health care; business and financial services; education; and government services, where a large proportion of jobs require some postsecondary training or college degrees.6 Meanwhile, the share of jobs in industries that historically have not required any postsecondary training has shrunk dramatically. These industries include construction, manufacturing, and natural resources—such as oil, gas, and forestry—and even they are increasingly seeking to hire skilled workers with higher educational attainment. Though America still has far to go, pathways leading to high-wage jobs and careers that will enable workers to provide for themselves and their families are still important goals for our education system. Just as important, schools must support parents rather than acting as a barrier to work. The U.S. economy is increasingly perceived as a zero-sum game in which only those who are already well-off reap the most benefits. And as the American ideal of a country in which economic mobility and opportunity are accessible to all seems to be moving further and further away, disillusionment with the political system grows. Embracing a progressive agenda for educational equity—detailed below in seven innovative policy ideas—is key to reclaiming the promise and once again putting the American ideal within reach. The U.S. education system must dramatically scale up effective tutoring models through national service programs, fellowships, volunteers, and high-quality virtual tutoring. States should provide a high-quality tutoring experience to every student performing below grade level. In addition to using existing state and local funds, school districts could use federal funds—ESSA Title I, Title II, and Title IV; Education Innovation and Research; AmeriCorps; and more—to finance these programs. To reap the benefits of tutoring but avoid the problems of SES, tutoring initiatives should grow from the ground up rather than as a result of a blanket mandate. Piloting and then a paced scaling of programs such as SAGA could ensure that tutoring programs work with local school communities instead of burdening already limited resources. In order to contain the costs of tutoring, tutors could be found and compensated by recruiting community volunteers, undergraduates interested in teaching careers, recent college graduates, or through the expansion of AmeriCorps. Teachers who want to participate could also be reimbursed for their additional time. Another way to contain costs would be through appropriate use of computer-based tutoring. There is evidence that computer-based tutoring can yield results similar to one-on-one tutoring in certain subjects, such as science, technology, engineering, and math (STEM) fields,27 or when certain principles of the cognitive science of learning—such as self-explanation—are embedded in the program or software.28 While these programs cannot replace the need for human interaction and relationships, they may be effective for some students and allow for greater targeting of resources toward students who most need traditional one-on-one tutoring. Since it is known that receiving low grades in elementary school is a predictive factor for dropping out during middle school and that receiving more than one failing grade in a core academic course during ninth grade is a predictive factor for dropping out during high school, tutoring can make a difference.29 Providing access to tutoring to improve students’ grades before they are at risk for dropping out could help them to complete further schooling, which, in turn, increases their likelihood of finding employment and earning a family-sustaining salary in adulthood. Though the school lunch program currently intends to provide meals for low-income students who need it most, stigma and shame prevent many students—particularly at the high school level—from accessing these meals, which is especially troubling since childhood hunger is still a pressing concern across the nation. Providing a healthy, nutritious breakfast and lunch to all students regardless of income would solve problems of access and also make the lives of all working families easier. 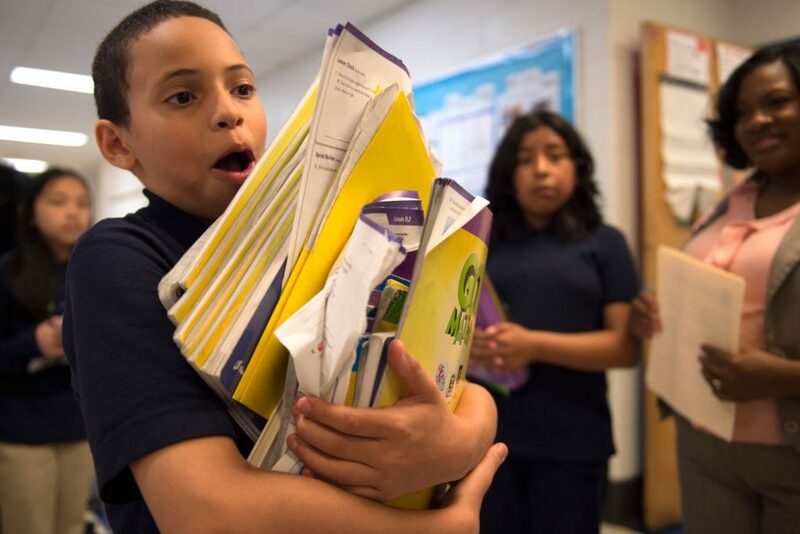 Forty-one million Americans, including 13 million children, do not reliably have enough food to eat.30 Meeting all children’s nutritional needs could keep students healthier, which would keep them at school and support their learning while there. Of households that experience food insecurity, less than two-thirds participate in one of the main federal anti-hunger programs: Supplemental Nutrition Assistance Program (SNAP); the National School Lunch Program; or the Special Supplemental Nutrition Program for Women, Infants, and Children (WIC).38 In part, this is because many food insecure households are not eligible for nutrition assistance or because certain barriers exist, such as the stigma associated with participating in programs designed to benefit low-income families. Expanding the federal school breakfast and lunch program in order to provide free meals to all students—including in the summer months—would reduce childhood hunger and improve children’s health and academic outcomes. For states and localities where universal access is unrealistic, an expansion of the community eligibility program, which allows schools and districts in low-income areas to serve free breakfast and lunch to all students without collecting applications, would be an interim step to consider.44 Making free meals universal would ensure that all students experiencing food insecurity have access to healthy, nutritious meals; end the stigma surrounding school lunch; and eliminate administrative barriers to accessing the program. All families—even those who could otherwise afford lunch—would benefit from this change. For instance, having healthy lunch options at school would alleviate the worry of packing lunch or parsing out lunch money on busy mornings. Absent federal action, states could embrace this policy by supplementing federal funds with state dollars in order to implement a universal school meal program. To be prepared for the jobs of the complex, dynamic, and rapidly globalizing future, all students should have access to opportunities to learn firsthand how their academic work applies to potential career paths and vice versa. Programs that allow for this exposure and provide students with a tangible outcome—such as college credit or professional certification—should be available in every district. Preparing students to confront and contribute to a rapidly changing world beyond their K-12 schooling means providing coursework that addresses these challenges; allows students the space to uncover and express their interests; and then provides them with the necessary resources to tailor their educational experiences to those interests. Many schools are redesigning the high school experience by implementing various models, such as career and technical education (CTE); personalized learning, apprenticeships; early college and dual enrollment; and language immersion programs—all of which can work for students’ individual needs. In order to increase the number of schools willing to experiment with such programs, states should incentivize school districts by creating or expanding grant programs that offer flexibility for students to learn outside of traditional school hours and beyond school buildings. States should also provide additional funding for apprenticeships and use grant programs to incentivize districts to form partnerships with local employers to offer summer internships or a semester of credit. Blending traditional instruction with advanced postsecondary courses and real-world career preparation prepares high school students for their next steps and helps them gain practical skills in growing fields. States should also seek to study and authorize charter schools that promote innovative high school designs with quality control systems in place or establish what is termed “innovation status” for traditional public schools. Innovation status, which provides a package of waivers to public schools to implement new school designs, has been enacted through legislation in states such as Colorado and Massachusetts.55 In addition, states should reform their systems of graduation requirements in order to reflect students’ comprehension of material instead of how many hours they attend a course. Such reform could also require local school boards to adopt graduation requirements that better reflect college and career-ready standards and provide credit for nontraditional courses. Lastly but critically, the federal government should increase its support for states in this work and leverage improvements to the quality of CTE programs through Perkins Act reauthorization. Federal policymakers should also allow for the integrated use of funding streams and incentivize states to target federal funding toward communities that are unable to provide these options through other means. The current school schedule is antiquated and makes balancing a job and child care extremely difficult for working parents. The federal government or states should pilot a school day that aligns with today’s work schedules. Currently, the average school day is less than seven hours and the median school day ends at 2:50 p.m.56 The average workday, however, does not align, requiring parents to make tough choices about their income, parental involvement, and child care. Nearly half of all U.S. workers report not having any form of flexibility in their work schedules, and almost 40 percent of all workers do not even have paid vacation time.57 Public school schedules are not based on student achievement but on an antiquated system that relies on two-parent, one-income households. Academic gains, economic productivity, and equity concerns should incentivize the federal and state governments to better align work and school schedules. However, teachers, already strapped for time and pressured by myriad responsibilities, cannot be expected to work several extra hours each day for nothing in return. Changing school schedules will require new and creative uses of time, personnel, and money. States could incentivize a longer school day by compensating teachers who want to work longer hours and by increasing requirements on public schools’ instructional hours. At the federal level, the Department of Education could promote the use of ESSA funding for expanded school schedules, encouraging high-poverty schools to use funds from Title I, Part A to pay for longer school days as part of a larger effort to boost student achievement. Congress could also increase funding for programs—such as Promise Neighborhoods, 21st Century Community Learning Centers, and AmeriCorps—that provide students with longer school days and access to after-school programs. Furthermore, the federal government could implement a pilot program under the university-assisted community model in order to partner graduate schools in social work with neighboring public school districts to develop a 9-to-5 schedule. Teachers should begin their careers with an annual base salary of at least $50,000 and receive supported training similar to that of a medical resident before becoming responsible for leading a classroom of their own. More experienced teachers with a demonstrated track record of excellence should have the opportunity to earn at least $100,000 annually. Teachers who are not adequately prepared to teach and who are not paid professionally may decide to leave the profession. Others—especially high-achieving young people—may never even consider teaching because of the profession’s relatively flat salary trajectory and because the professional work environment does not match that of other career paths.69 Teachers have less flexibility in their schedules compared with other professions, sometimes even struggling to find time to use the restroom.70 They also struggle to find time to collaborate with peers and often have to pay for their own supplies.71 To ensure that high-quality teacher candidates enter the profession and that excellent teachers stay in the profession, all educators should be trained and compensated like the professionals they are. Steps, therefore, should be taken to improve the professional work environment for teachers where possible. Federal and state policymakers should make legislative changes that put an end to the huge gap in earnings between the teaching workforce and other college-educated professionals. To start, all teachers should begin their careers with a base salary of $50,000. More experienced teachers with a demonstrated track record of excellence should earn no less than $100,000 annually. One option for moving toward a professional scale for teachers would be a $10,000 federal tax credit for teachers in high-poverty schools, which would close the gap between teacher salaries and those of other college graduates. States could implement a similar policy, with the tax credit adjusted to close the gap between teachers and other college-educated professionals in their state, particularly for teachers in high-need schools or subjects. Teachers—like all new employees—improve their practice after being in the profession for a few years. Policymakers should do more to accelerate the learning curve by expanding teacher residency programs, clinical preparation, and induction programs to improve new teachers’ skills and by extension, their students’ learning. A new federal program could be funded through the Department of Education and administered by AmeriCorps, which already provides grants to residency programs run by nonprofit organizations, such as the Memphis Teacher Residency and Urban Teachers. States could expand funding for these programs in partnership with institutions of higher education, school districts, and nonprofit organizations; and they could use Title II, Part A funds to do so. States such as Louisiana have already begun this important work of leveraging federal dollars to create and expand residency and induction experiences for all of their teachers;72 others should follow their lead. Hire additional specialized instructional support personnel (SISP)—school counselors, school social workers, and school psychologists—to ensure that all students have access to academic, career, mental health and social-emotional support. By reducing staff-to-student ratios and carrying out targeted and schoolwide mental health interventions, students’ well-being and academic achievement can be improved simultaneously. One in 4 children experiences a mental health disorder annually,73 and half of those who will have a mental health disorder at some point in their life will first be diagnosed at age 14 or younger.74 Furthermore, about half of all children will experience a traumatic event—such as the death of a parent, violence, or extreme poverty—before they reach adulthood.75 And as the opioid epidemic continues to grow, students are coming to school affected by a parent’s addiction as well as the havoc and instability that it can wreak on family life.76 In addition, as students experience other issues—such as puberty; family matters, like divorce; and bullying—having supportive trained adults to talk to in school is critical for improving their well-being and attention to learning. Mental health issues such as attention difficulties, delinquency, and substance use are associated with lower academic achievement and attainment.77 Likewise, experiencing trauma is associated with lower standardized test scores and an increased risk of being diagnosed with a learning disability or behavioral disorder.78 When children experience trauma, it not only affects their own learning but also that of their classmates. For example, when a student is experiencing domestic violence in the home, the reading and math scores of their classroom peers also decline.79 Researchers have found students in class with a peer who is experiencing domestic violence also had more behavioral infractions; they theorized that there were spillover effects that changed the context and culture of the entire classroom. Even though school is the most common place for young people to receive mental health services, shortages of school-based mental health personnel are one of the main reasons so many children do not have access to such services. Major providers of mental health services in schools, such as school psychologists, are operating at ratios far higher than recommended, often with one person serving multiple schools.82 With so few of these personnel serving so many students, it is impossible for students’ needs to be met. School counselors also act as academic or guidance counselors, handling curriculum planning; interpreting and maintaining student records; and providing college counseling.85 Many students who would be the first in their family to attend college desperately need help planning for and navigating this process, as they might have fewer adults in their lives who can provide information about college admissions and financial aid.86 Every student who needs it should have access to this type of adviser and advocate who can help guide his or her college and career choices. To better serve students, mental health counseling and academic guidance roles should be separated, and all students should have access to both types of supports. In addition, every student with pressing mental health needs should have access in school to counseling from a trained professional, and every school should have the personnel necessary to implement schoolwide behavioral support and social-emotional learning programs. It is necessary to create a national school infrastructure program that will update school buildings while simultaneously creating jobs in local communities. As the stories coming out of places such as Baltimore, Detroit, and Puerto Rico make plain, a safe and comfortable school building is an important precondition for students to learn to their full potential. Children’s health and learning are affected when schools have poor air quality, cannot maintain a comfortable temperature, are excessively noisy, or are poorly lit.92 School infrastructure projects are a wise investment because well-maintained school buildings can last up to 50 years and facilitate achievement of student outcomes. A national school infrastructure program to update unsafe or unhealthy school buildings and create a national database on the condition of school facilities would also provide thousands of jobs across the country. Under such a program the majority of the funding should be targeted to schools with highest need, with the remainder set aside for low-cost bonds. This school infrastructure program would bring the neediest school buildings to a state of good repair and allow other schools to modernize and even retire debt for recent capital investments. And for every billion dollars spent, this program would create thousands of jobs—including both direct and indirect hires—for the life of the program. School buildings act as convening spaces for the community, and schools receiving these infrastructure funds could use them to meet various needs of the local school community in accordance with state and local laws. In 2009, the Justice Policy Institute noted that some states have begun to decrease the size of the prison population—thereby reducing spending—by providing community-based substance-abuse treatment programs, increasing rehabilitation efforts, improving parole mechanisms and services, and decriminalizing nonviolent offenses.105 States that intentionally decreased their prison populations saw crime decrease even faster than national averages.106 Other states should consider such reforms. Economic dislocation is a powerful threat to the well-being and security of American workers and the American economy. Millions of Americans feel anxious about the changing economy. Working-class jobs that once promised a lifetime of decent wages and benefits are disappearing, displaced by automation and jobs that favor a different set of skills. Education is at the root of the country’s broader economic challenges, and improvements to the education system offer the solution. Employers need talented workers who have the skills, disposition, and knowledge to operate effectively in the new economy. A progressive education agenda can ensure that all Americans are afforded the education needed to meet these challenges. Lisette Partelow is the director of K-12 Strategic Initiatives at the Center for American Progress. Catherine Brown is the vice president of Education Policy at the Center. Sarah Shapiro is a research assistant for K-12 Education at the Center. Stephenie Johnson is an associate campaign director of K-12 Education at the Center. Organization for Economic Cooperation and Development (OECD), “Education at a Glance 2017: OECD Indicators” (2017), available at http://www.oecd-ilibrary.org/docserver/download/9617041e.pdf?expires=1519148041&id=id&accname=guest&checksum=42796EF455E675E79827B115C2A9ADA9.